The Oar Sharpener is the perfect jig to use when sharpening all sizes and shapes of gouges, v-tools, and chisels. 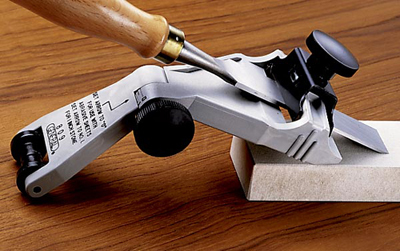 The jig holds and guides a woodcarving tool at a constant angle while sharpening on a bench stone. It also works with bench chisels up to 1-1/2" wide. Made of machined aluminum, includes detailed instructions. The Oar Sharpener makes sharpening tools that would otherwise be a challenge, a breeze. 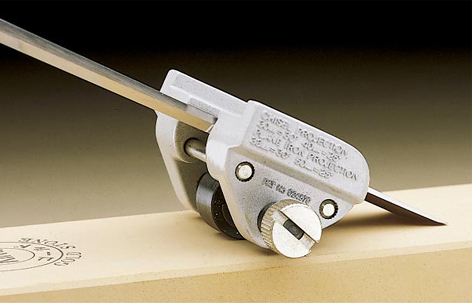 The adjusting knob determines the bend in the guide's body and the angle of sharpening at the tool's front edge. Angles can be set with the printed scale, a protractor or by eye. Spring tensioned clamp holds tools up to 2-5/8" wide. Two-wheeled rear roller moves in a straight line during use and will not wander sideways like other guides. Lightweight sharpener is made of high-impact Lexan. 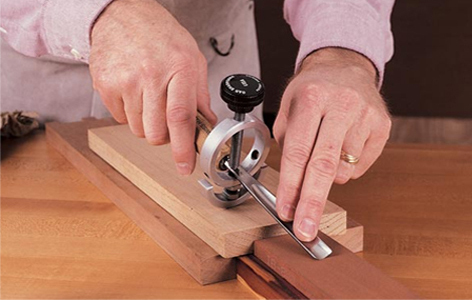 You can hone edge tools between grindings with this unique self-centering guide. Chisels and plane irons from 1/16" to 2-5/8" wide can be held securely in one of the two sets of stepped jaws. The accurately ground hardened steel roller glides across the surface of the stone to allow for a consistently fine edge. Complete instructions are included.